Something odd I recently noticed but didn’t pay too much attention to while looking for product pricing on keyboards was that Newegg has recently changed their review system from individual products to an aggregation of product families. For those asking what this means, a good example is when looking at products like AIOs and Motherboards, when looking at a Corsair H100i you also get reviews for the H55, H110 and H60 all bundled into one. Thankfully you can change this to sort to only the specific product you are looking at. Our very own Keith covers this in the video embedded at the bottom of this article. This makes looking up something like motherboards with many different products being listed under the same banner with very confusing since the products can have incredibly different feature sets and performance categories. Looking above you see almost the entire Gigabyte Z370 product lineup. 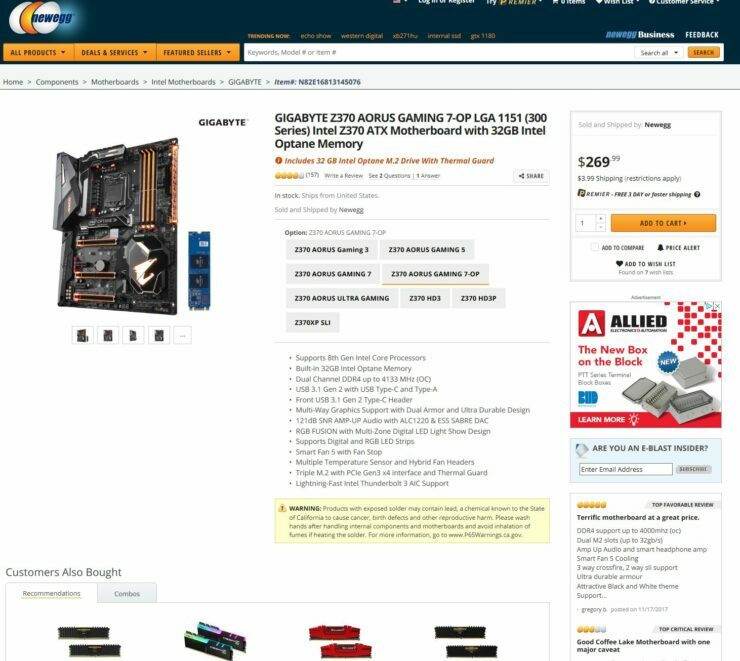 Even though we are looking at the top of the line Gigabyte Z370 Aorus Gaming 7 priced $269 with 32GB of Optane memory pictured above, the review on the right is labeled “Terrific Motherboard at a great price” for the Gigabyte Z370 XP SLI which is $138. While I can’t say for sure why this is being done, I would assume it is for the purposes of having more reviews streamlined or appearing like there is more feedback than there actually is for the product. This also can have the problem of unstable hardware or software issues in one specific model to hurt the reviews of similar products. All in all this makes the already difficult process of buying computer hardware even more confusing for those new to the PC building world and can complicate things for even those of us who are seasoned veterans. We do hope Newegg changes this soon.